The purchase includes Fox's film and television studios, as well as its 39% stake in satellite broadcaster Sky. Mr Murdoch turned a single Australian newspaper he inherited from his father at the age of 21 into one of the world's largest news and film empires. He said the break-up makes sense amid new threats from online advertising and competitors who are streaming entertainment into homes via the internet. "With today's announcement, we launch the next great leg of our journey," Rupert Murdoch said on Thursday in a call for investors. He added later: "Are we retreating? Absolutely not." Disney will assume $13.7bn in Fox debt as part of the stock deal, taking the total value of the transaction to more than $66bn. Why does Disney want them? The firm believes this deal will give it the scale to compete, and expects to wring "at least" $2bn in cost-savings out of the new company to boot. 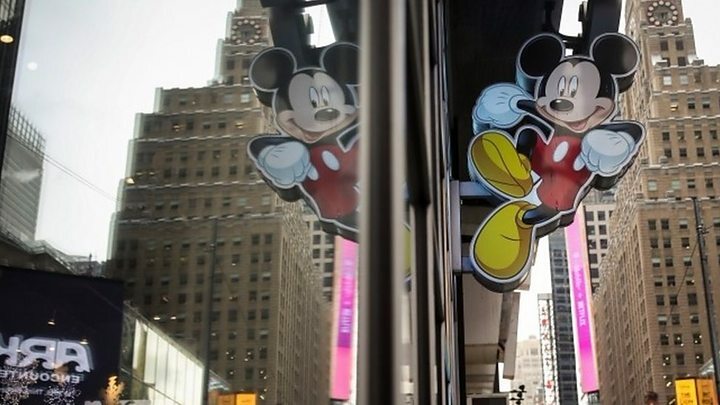 David Yelland, former editor of the Murdoch owned Sun newspaper in the UK, told the BBC the transaction puts Disney in pole position to compete with California's tech giants. "In ten years time there'll be two Chinese giants and four US giants and [of the current entertainment companies] the only one that'll survive will be Disney." Fox is creating a smaller firm focused on news and major live sports events in the US. Lachlan Murdoch said: "While the merged business is about scale, the new Fox is about returning to our roots as a lean, aggressive, challenger brand." There has been speculation the deal opens the opportunity to reunite Fox with the news businesses which were spun-off in 2013 following a scandal over phone tapping in the UK. That prompted the creation of a separate news publishing group, News Corp., which owns the Times and the Sun newspapers and remains controlled by the Murdochs. Rupert Murdoch said the firm hasn't looked at that possibility and any move along those lines is "way ahead" in the future. As part of the deal Fox shareholders will receive Disney stock, representing about 25% of the enlarged company. What does it mean for Sky? In the UK, Fox is in the midst of a bid to buy the part of the broadcaster Sky that it doesn't already own. That bid is being investigated by the Competition and Markets Authority (CMA), which is due to publish provisional findings in January. The BBC understands that the Disney deal will not alter that CMA investigation. If the Sky purchase is approved, that deal would probably go through before the Disney purchase of Fox assets. So the whole of Sky would then be likely to transfer to Disney's ownership. If not, then just the 39% of Sky currently in Fox's stable passes to Disney. Rupert Murdoch said: "If things go wrong, the existing [Sky] shares go to Disney. It will be up to them to decide what to do." Either way Sky's future will lie primarily in Disney's hands. What about the Murdochs themselves? Most observers expected Rupert Murdoch to hand over his vast media empire to his two sons James and Lachlan. So the decision to break it up came as something of a surprise. The management of the new Fox company is still being discussed. But Rupert Murdoch told Sky he hopes his elder son, Lachlan, will become chief executive. James has been widely tipped to take on a senior role at Disney. On Thursday, Disney boss Bob Iger, who is staying in his role running Disney until the end of 2021, said James will be involved in the integration of the two firms. As for the future he said: "He and I will continue to discuss whether there's a role for him here or not, but I look forward to talking to him about it." Will this make it past the regulators? The companies said they expect to complete the transaction in 12 to 18 months. But it is not clear how the deal - which increases consolidation in the movie and sports media industries - will be received by US competition regulators. It is possible officials would take a similarly dim view of a Disney-Fox tie up, in which case Disney would pay Fox a $2.5bn break-up fee. The Writers Guild of America West, a union that represents writers for television and movies, said it opposes the deal on the grounds that it would increase Disney's already sizeable power. It said: "The antitrust concerns raised by this deal are obvious and significant." Would Rupert Murdoch break up his empire?